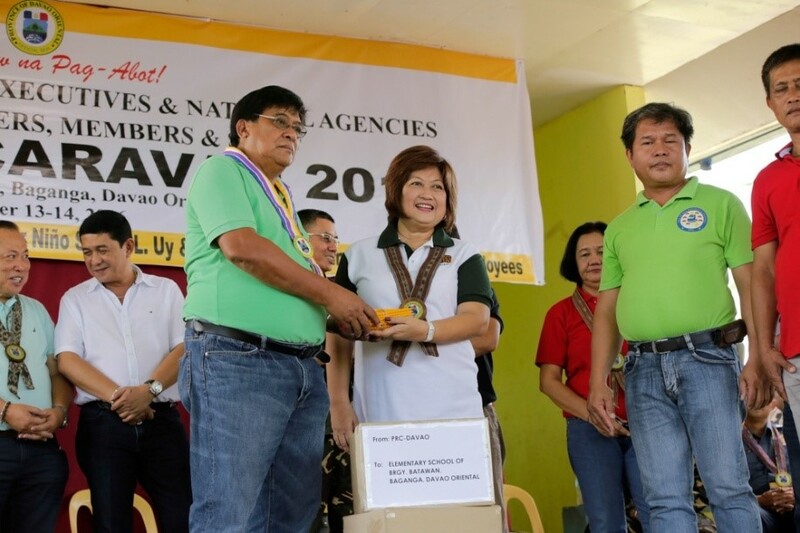 DAVAO ORIENTAL – Thousands of residents in three far-flung villages in Baganga town in the Province of Davao Oriental have received free goods and services through a government project that bids to bring care and services closer to the people. 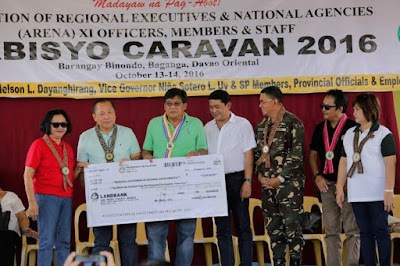 The 18th Serbisyo Caravan organized by the Association of Regional Executives of National Agencies (ARENA) in partnership with the Provincial Government of Davao Oriental and Municipal Government of Baganga, became a venue in the delivery of various services such as medical and dental services; distribution of food packs, medicines and school supplies; turn-over of cash assistance, seedlings and fingerlings; legal consultations; and scholarship applications, among many others to the impoverished remote villages of Binondo, Mahanob and Batawan, which are among the many areas hard-hit by the devastating typhoon Pablo in 2012. 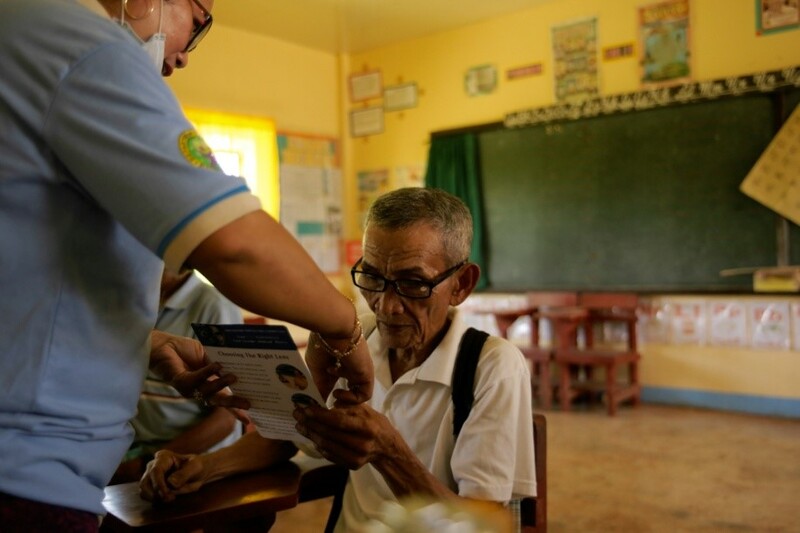 Residents of these villages trooped at the barangay gymnasium during the two-day activity held on October 13-14to avail of these ‘precious’ services. They described the Serbisyo Caravan as a very welcome project that has truly touched their lives as it offers services closer to their homes. They say that the government’s move of reaching out to their community has saved them a lot of time and money as they don’t have to travel long distances down to the regional center or in the city to avail of these services. Resident Luisita Mangguiob, during the Serbisyo Caravan, has availed of the Department of Trade and Industry’s skills trainings on amacan-weaving. “I am really happy that I have availed of this training program as this could open up new opportunity for me in terms of livelihood,” she said. “I am so glad that government services have reached our area since we are so far away from town. It means a lot to us having received such care from our government. It’s like having a one-stop shop of government services right here at our doorsteps where we couldcommunicate many of our concerns as well as receive government assistance,” she added. Nelson Matibay, a resident and leader of a nearby sitio who has received rice assistance said he is thankful that he and scores of others from their small sitio were given assistance by the government. “Today, I have seen how government agencies have worked together and came a long way just to provide us their services. We do appreciate that a lot,” he said. The ARENA is a group composed of regional, city and provincial directors and other heads of national government agencies as well as the Philippine Army’s 10th Infantry Division based in Davao Region. The 701st Brigade of the Philippine Army, through its troops in the 67th Brigade thathave been working at the grassroots level, has pushed for the conduct of this year’s Serbisyo Caravan in Davao Oriental. Having a firm grasp and understanding of the plight of the people in the hinterlands, the military has recommended these three identified barangays to become the venue of this year’s Serbisyo Caravan. 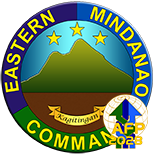 701st Brigade Commander Col. Bienvenido R. Datuin, Jr. said that based on the needs assessment survey that the military has conducted, these villages turned out to be among the areas that need the most help from the government. 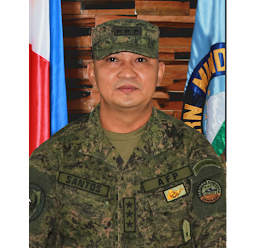 Brigadier General Casiano C. Monilla, Assistant Division Commander of the 10th Infantry Division of the Philippine Army, expressed his thanks to the ARENA for heeding the military’s call to pool and bring the sundry services of the government in these identified villages. He said that the military’s efforts in reaching out to the communities through the Peace and Development Outreach Program (PDOP) serves asthe key to convey to the government agencies the urgent needs of the people. Governor Nelson L. Dayanghirang says he is very thankful to the ARENA for choosing his province to benefit on these overwhelming services which are very much-needed by the impoverished families in these hinterland villages. He also thanked the Philippine Army for paving the way in making this activity possible. He said the project is one of the best ways for the government to effectively win the heart of the people especially those living in vulnerable areas. Baganga Mayor Arturo Monday told the residents of the three barangays to take advantage of the opportunity to avail of these services. He said that they are very lucky to have been chosen as the recipients of this year’s Serbisyo Caravan. “Among all the places in the region, we have been hand-picked to avail of these many services,” he said, while underlining the military’s role in pushing for this program to happen here. ARENA President, Regional Director Engr. 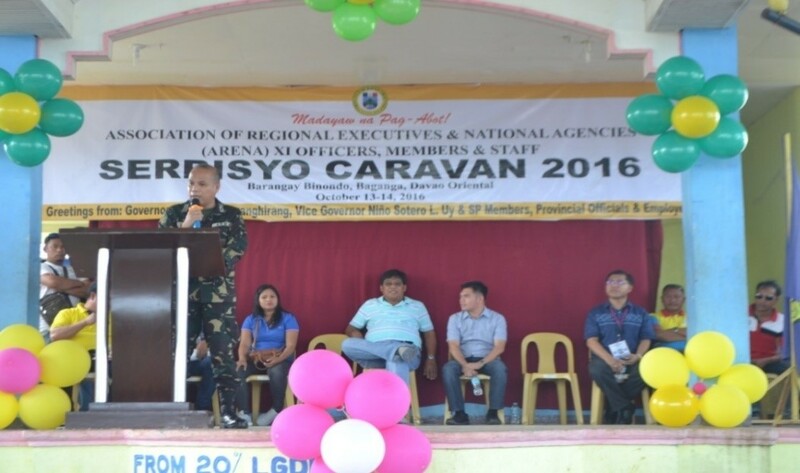 Mariano R. Alquiza of the Department of Public Works and Highways (DPWH), said that the Serbisyo Caravan is the government’s way of providing care to the people especially those in the marginalized sector. As part of its long-term intervention through sustainable projects, the ARENA led by Alquiza has conducted a forum with local officials to discuss the other needs of the community that the government could address. He said this aims to build a progressive community wherein all the residents will have shared benefits on the development. “We only envision one thing – a progressive society where people are heard, seen and felt because these senses will open wide range of extending help, whether in service in making action that will benefit not just one interest but the collective goal in the need of the public,” he said. Piloted in 2011 in the Province of Davao Oriental, the ARENA Serbisyo Caravan has already reached many parts of Davao Region in the past six years. 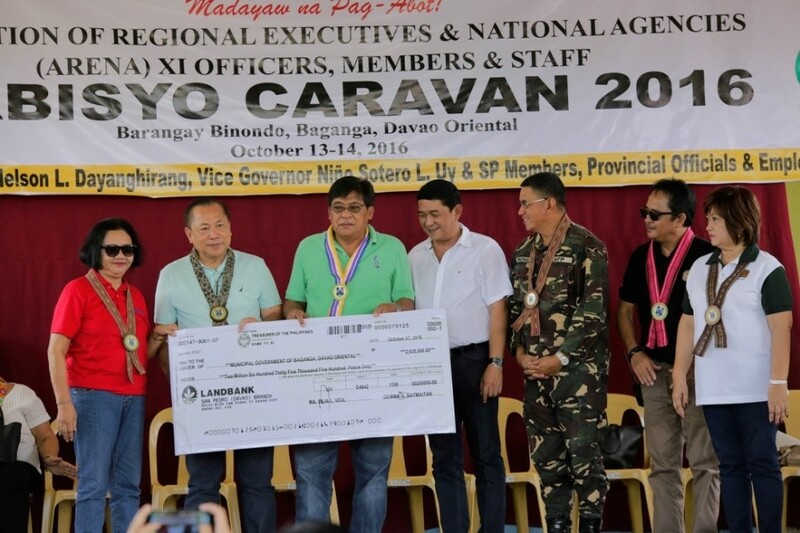 The Serbisyo Caravan in the region, said Alquiza, has been lauded in the national level as it is the only one existingthroughout the country. 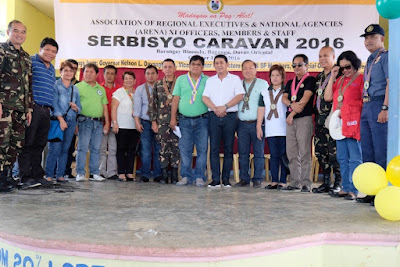 This year’s Serbisyo Caravan saw the participation of thirty-six government agencies who brought along with them goods and services provided by their hosts of personnel and staff. During the two-day Serbisyo Caravan, the Department of Environment and Natural Resources (DENR) has distributed 2,000 cacao seedlings to 265 beneficiaries as part of its National Greening Program (NGP) and has provided advocacy lectures on the protection of caves and wetlands. The Department of Agriculture has distributed various farm inputs worth to P2.5 million which consists of cacao seedlings, cassava bundles, OPV corn seeds, and assorted vegetable seeds, among many others. The Bureau of Fisheries and Aquatic Resources (BFAR) has distributed 40,000 tilapia fingerlings to resident fishpond operators. The Philippine Fiber Industry Development Authority (PFIDA) has conducted farms survey and training on abaca production and quality enhancement. The Department of Agrarian Reform facilitated the enrollment of Agrarian Reform Beneficiaries to the Philippine Crop Insurance Corporation (PCIC). 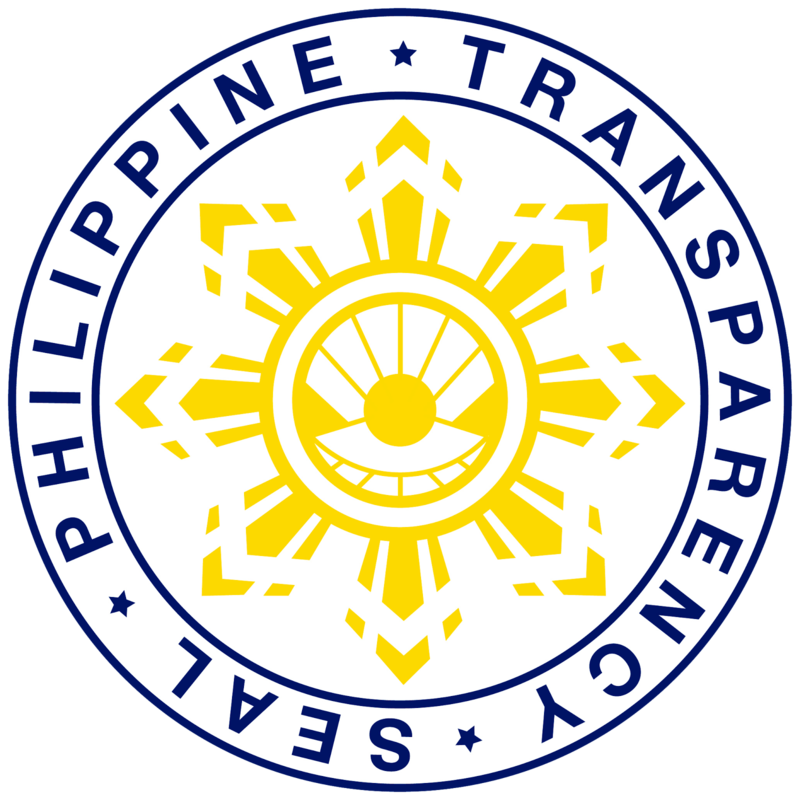 The Philippine Coconut Authority (PCA) turned over checks amounting to a total of P888,000.00 to 163 farmers. The Department of Trade and Industry conducted skills training on amacan weaving and productivity skills training on rubber production and processing, among others. 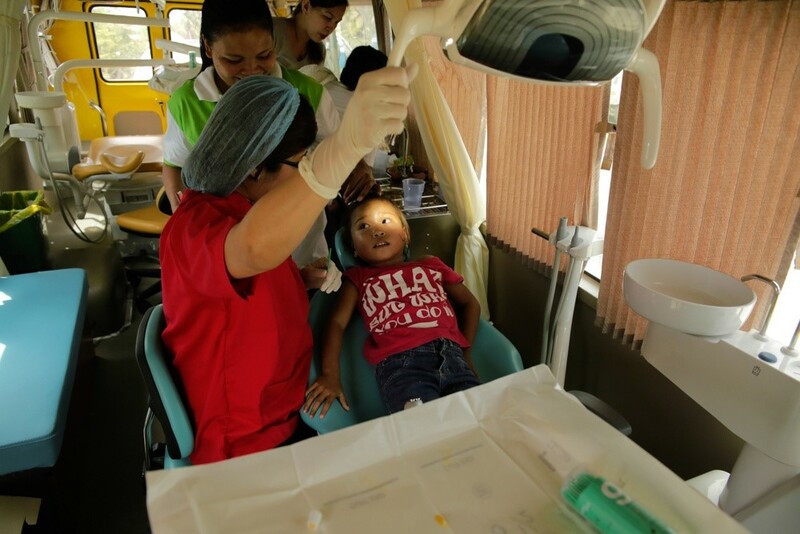 The Department of Health (DOH) offered medical examination and dental checkup and extraction, distributed medicines, and conducted health information drive.The Philippine National Police, the Department of Public Works and Highways (DPWH) and the Philippine Coast Guard offered consultation and dental services. The PhilHealth facilitated processing of membership of residents and printed Philhealth ID’s to those members without ID. The Department of Social Welfare and Development (DSWD) has distributed foodpacks to 4,000 families; provided assistive device wheelchair, crutches and quad crane; turned over check amounting to P 3.2 million check for supplemental feeding of some 2,487 children; provided corn mill machine and corn mill building; and turned over social pension check for 118 pensioners. The Department of Education provided school supplies and learning kits while the Technical Education and Skills Development Authority (TESDA) conducted training induction program, skills mapping, and free haircut and massage. The Commission on Higher Education (CHED) conducted information dissemination on scholarship grant and grant-in Aid Programs. The Philippine Science High School conducted information drive on their institution’s programs.The Department of Energy (DOE) has distributed compact fluorescent lamp to 1,200 households. The Land Transportation Office (LTO) has facilitated student permit license applications, motor vehicle inspection and emission testing which was done separately at the Baganga Municipal Gym. The Public Attorney’s Office (PAO) has conducted legal consultation. 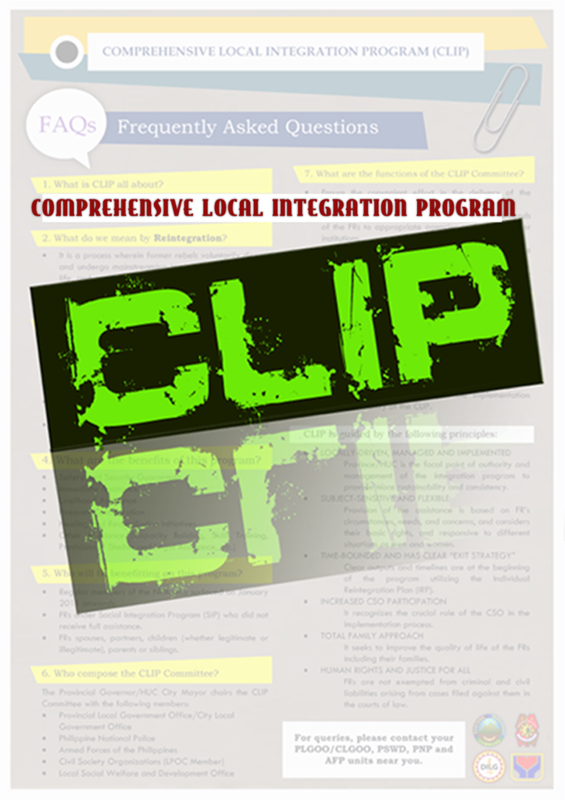 The Department of Interior and Local Government (DILG) has provided IEC material and legal assistance on local governance and distributed checks to rebel returnees. The Department of Justice has disseminated information on their programs. The Professional Regulations Commission (PRC) in collaboration with the Integrated Philippine Association of Optometry, Inc. have distributed 3,000 pieces of pencils and conducted free eye screening and provided free eye glasses to 100 beneficiaries. The Department of Science and Technology (DOST) distributed Rice Mongo Sesame ready-to-cook food blend and demonstrated production of dish washing liquid and powdered laundry soap. The Department of Labor and Employment (DOLE) turned over three units of mobile corn mill. The Philippine Ports Authority distributed flyers, pamphlets on Violence Against Women and their Children and Anti-Human Trafficking. The Philippine Drug Enforcement Agency (PDEA) has conducted Anti-Drug Abuse Lecture. The Commission on Elections has released voter’s ID. The Philippine Army has provided security, logistic support, and support in the preparation, on top of their role as the key agency in making this Serbisyo Caravan realized here. 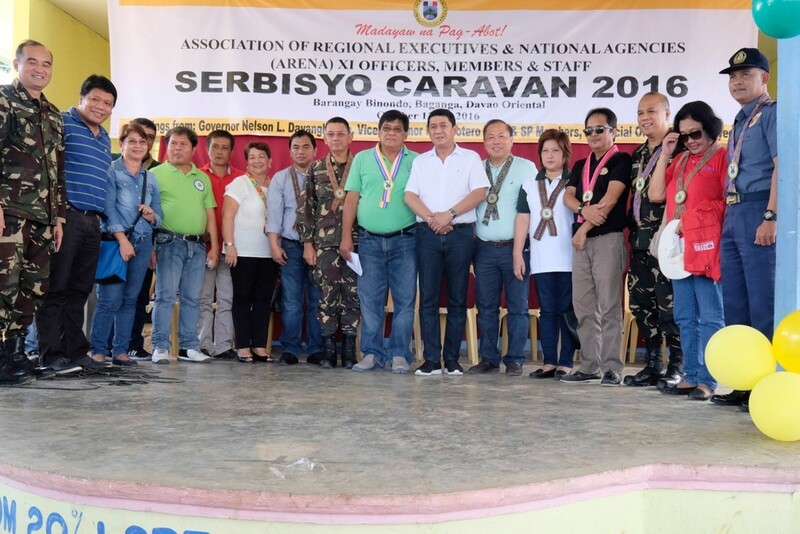 The agencies who have participated in the Serbisyo Caravan, said Alquiza, have proved that through collaboration, the government can truly bring its services closer to the people.